Help to ring in the spirit of Christmas with this musical medley of munchies all set in a wonderful drum like basket! This beautiful Burgundy and Gold Drum basket will make a wonderful serving basket when lined with linen, planter for their holiday poinsettias or simply a lovely decoration in their home or office this holiday season! 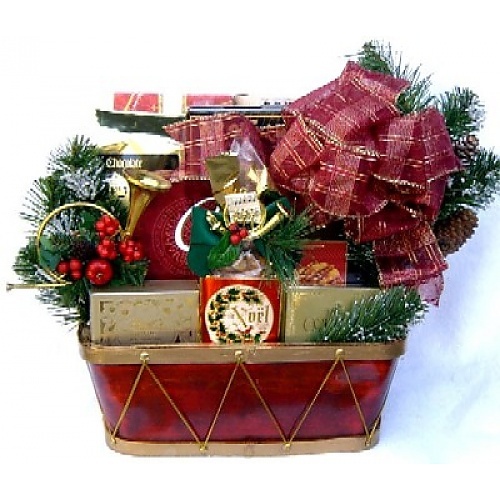 Accented with frosted pine and pine cones and topped with a beautiful designer bow, this Christmas gift basket will have them humming a very happy tune this Christmas! !